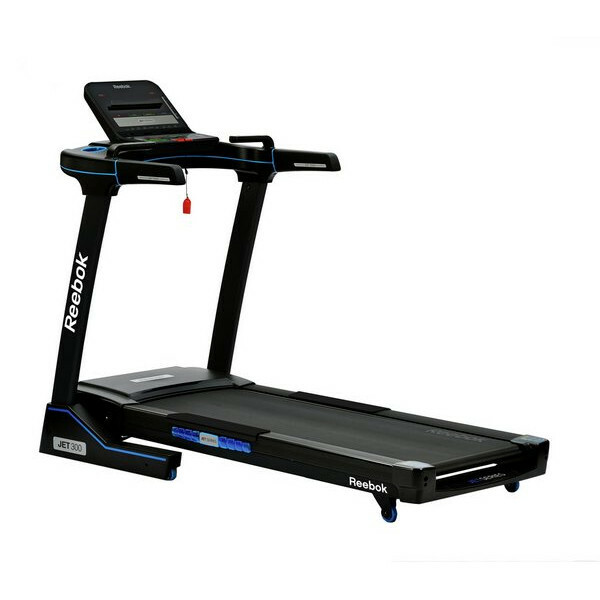 The Reebok Jet 300 treadmill is part of the current Jet series range from this well respected manufacturer. But just how different is it to its siblings and is it really worth the extra money? To find out we got our hands on one to take a closer look. Aesthetically it’s very much the same as the other Jet series treads but is dressed in jet black with a blue trim colourway which works really well. It’s neat, tidy and modern and would settle comfortably pretty much anywhere. The basic specs look respectable here. 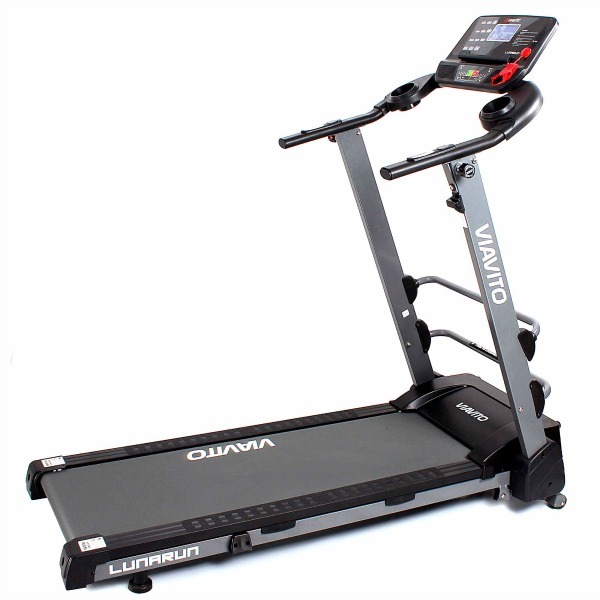 There’s a 2.5hp motor, 51cm x 150cm (20” x 59”) oversized running area, 15 levels of electronic incline and 27 different workouts. With a motor and deck this size the Jet 300 is suitable for most runners regardless of height and with a max user weight of 140kg (22 stone) it will cater for most family environments. Cushioning is provided by way of the Jet Airpods seen on the other Jet series machines, and, true to form, the running experience is a good one. Not too hard to jolt and shock the bones but not too soft and bouncy meaning that you get a soft landing and a good launch at the same time. It’s a good system that’s proven and one that compares well with other more basic systems to be found on many other models. There’s a good balance here though this shouldn’t come as a surprise given the manufacturer. 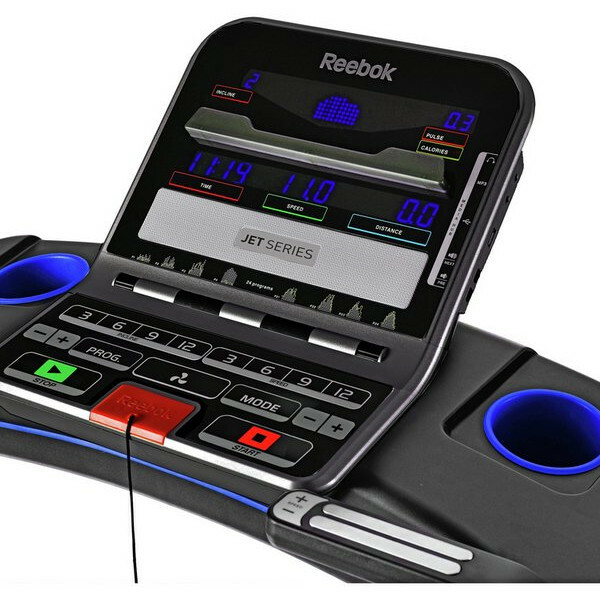 Reebok describe the Jet 300 as having 15 levels of incline and it’s important not to get this confused with % incline as it’s not a true 15% incline. 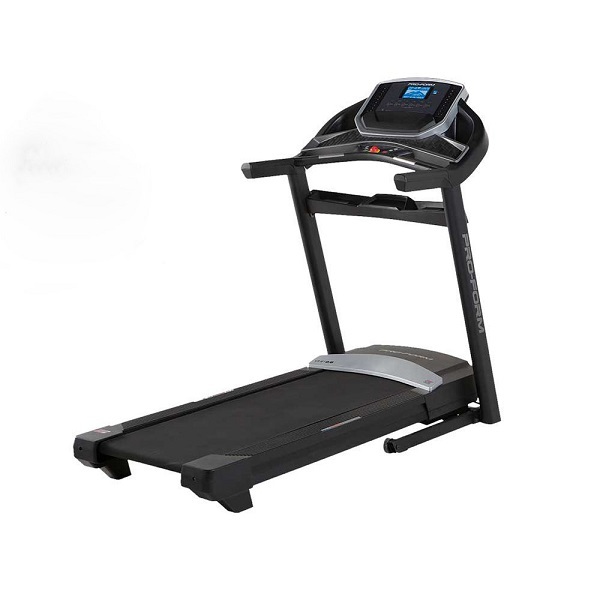 That being said it is capable of reaching a level of steepness that’s going to present a challenge to most buyers of this machine and the transition speed from one incline level to the next is certainly respectable making it a solid choice if you like your interval or HIIT training. 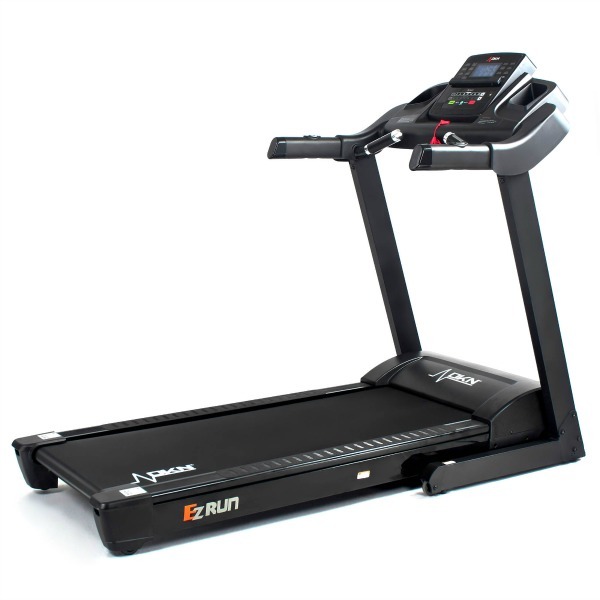 With a top speed of 20kph (12.5mph) it has enough guts to give even experienced runners something to think about and if you combine both the speed and the incline here and you’ll know you’ve been for a run! The console features table holder and speakers as well as cooling fan, but the best thing about it is the bright blue LED display. 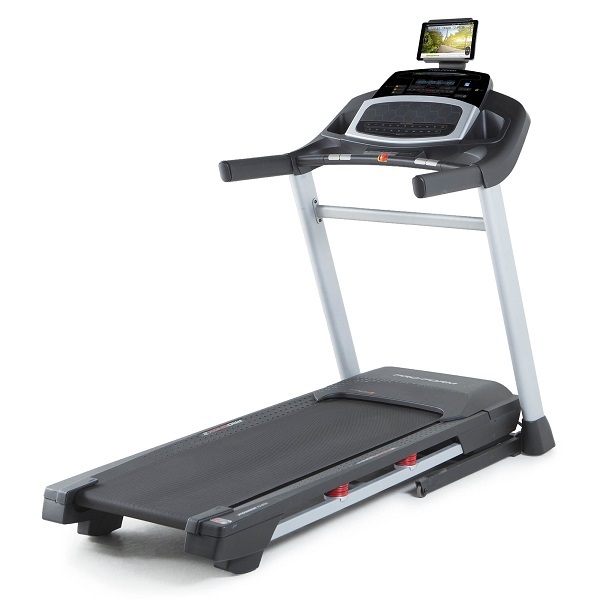 The use of LEDs makes it easy to see the screen more or less regardless of ambient light conditions and the feedback for time, speed, distance, pulse/calories, and incline is all nicely separated, each set having its own window which makes for very quick and easy reading of the stats while you’re running. There are 27 different workout modes with plenty of preset workouts as well as the ability to design and program your own personalised workouts. Inputting your own workouts isn’t too fiddly but if you can’t be bothered with all that you can simply press start to run in manual mode and adjust the settings in real-time during your run. All in all this is a good offering from Reebok. 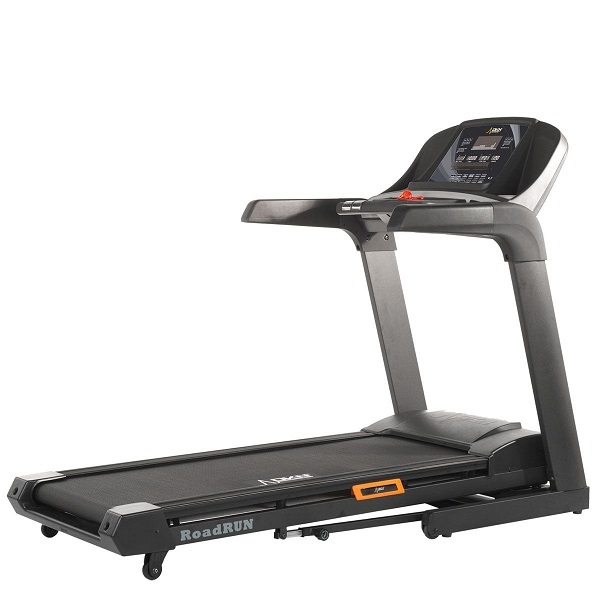 It offers more than its siblings in terms of the specs and is certainly a decent treadmill. Though whether the extra 2kph on the top end of speed and the extra 0.25hp compared with the next one down in the range really justifies the price difference is open to debate. 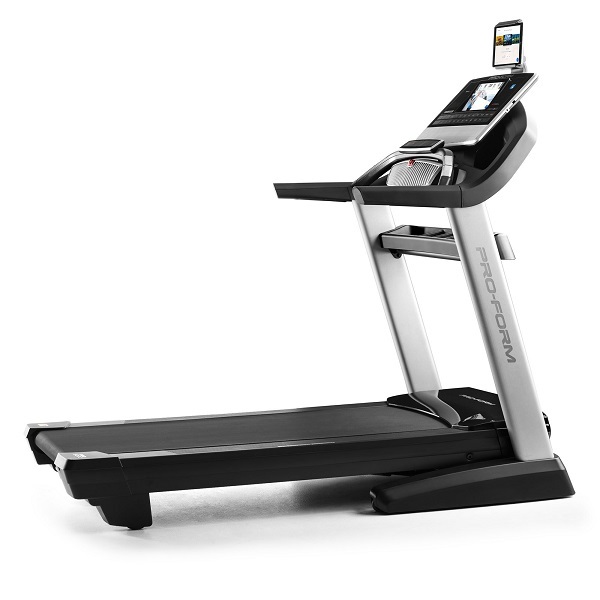 Verdict: A good, solid treadmill that will likely tick the boxes for a lot of people. The Reebok Jet 300 is not currently available from any retailers we're aware of in the UK. The Reebok Jet 300 is everything we've come to expect a Reebok machine to be. It's got a very modern look and feel, the specs are good, there's plenty to keep you motivated. The running area, motor and max incline are all very respectable, though if you look around a bit there is better value to be had out there. 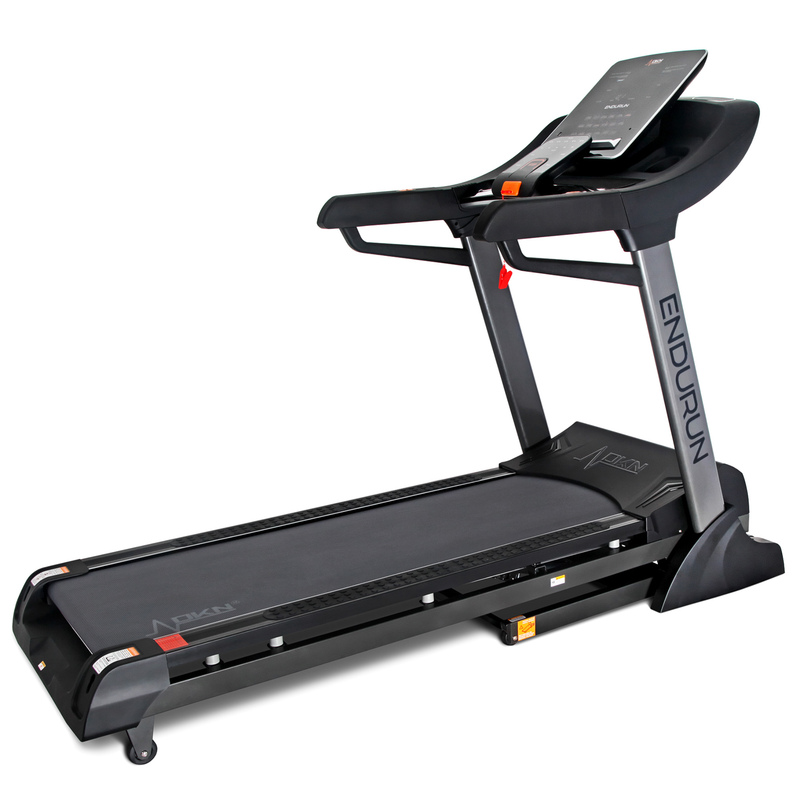 Take the DKN EzRun for example which is a high-spec, full-size, full-function machine and is available for a lot less!